More info:Group max 12, average 4-12. From £1540 ex flights. Fully escorted - includes transport, accommodation, activities specified, part board. Room sharing/ single rooms at a small supplement. Excludes visas and tips. Fully licensed and ATOL bonded. This two week Sri Lanka holiday, island explorer, is a wonderful introduction to this beautiful and diverse island. Explore the ancient cities, temples and spice gardens of the Central Plains and Cultural Triangle; head up into the cool hills to discover tea plantations and plunging waterfalls; and then spend time on the Southern Coast, where you can choose from a range of optional activities, from whale watching to a wetland bird watching safari. 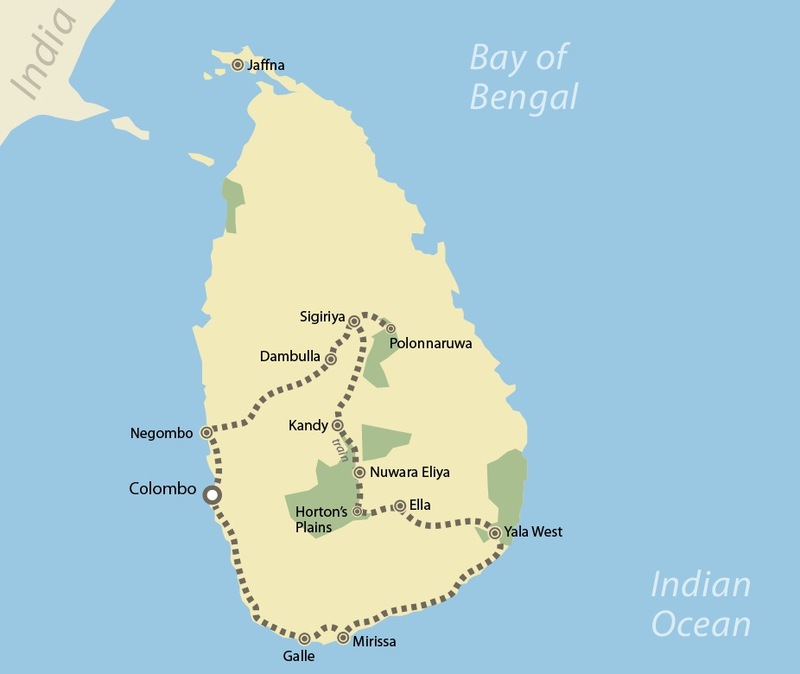 As well as exploring Sri Lanka’s culture, and taking in six UNESCO World Heritage Sites, we will also enjoy the island’s wildlife and magnificent scenery, in Udawalawe and Horton Plains National Parks. Throughout, there will be plenty of time to relax and just do your own thing, too, on this perfectly paced two weeks. There is a huge range of activities included in this holiday, including an evening street food tour in Colombo; the cave temples at Dambulla; the spectacular Sigiriya rock fortress and tea tasting in the highlands; jeep safaris in Udawalawe National Park and time relaxing at a secluded beach resort on the south coast. This tour runs from November to April, taking in places unaffected by the monsoon. If you prefer to visit from May to October, please see our Sri Lanka tour, off the beaten track. If you have more time to spare, you could also add on a tour to the Maldives, taking in off the beaten locations, or simply relax at an island eco resort. Small group holiday, max. 12 people. Flights, accommodation, all breakfasts, some meals, guide, activities, all transport. Hotels, safari camps and beach chalets. Solo travellers welcome. £375 supplement for own room. The Sri Lanka Island Explorer tour introduces travellers to the culturally rich and environmentally diverse island state of Sri Lanka, with an emphasis on contributing to the local economy and community projects while respecting local traditions and the natural environment. Sri Lankan guides are at the heart of the tour, whether driving visitors around the island, taking treks at Horton Plains or leading safaris in Yala West National Park. Some of the guides come from community-led projects such as the Woodlands Network, which helps local people gain access to education and employment. This tour supports various environmental initiatives including bird watching in Kalametiya Sanctuary, the Yala West and Horton Plains National Parks and 6 UNESCO World Heritage Sites. Entrance fees to the National Parks contribute to conservation projects throughout all national parks. Accommodation used on the tours employs local people and the majority are locally owned. The accommodation used in the Cultural Triangle has been built and refurbished using reclaimed materials from decommissioned tea factories and the site was left undisturbed with no trees cut down or lakes drained. All vegetarian food is grown in its local gardens. The tree houses are built from local materials and any building in this area is compelled to contribute to the agriculture of the area. The owner grows fruit and vegetables for our clients and also enables local people to cultivate their own plot on his rented land. The Palm Paradise Cabanas at Tangalle, although situated in a palm grove were constructed without any palms being cut down and cabanas and villas are again built from local material. They are very active in water and power conservation and educating their clients to take conservation seriously and responsibly. Sri Lanka community-led projects: The Asian Tsunami highlighted the plight of coastal communities in Sri Lanka and our initial projects were targeted at Sri Lankan individuals and communities devastated by the tsunami (please ask us for details). However, many other communities away from the coast also lack essential materials and services and our objective is to offer long-term support to such Sri Lankan individuals and communities. By channeling all donations received by Forgotten Village Sri Lanka (a charitable organisation currently applying for charitable status with the Charity Commission) into community-based projects on the island, we hope to provide sustained assistance to these communities in their endeavour to improve their lives. We make a contribution to Forgotten Village Sri Lanka for every holiday booked. otherwise never have noticed. Refreshingly there was also enough leisure time, amidst all the exciting activities, to relax and thoroughly absorb the atmosphere of the place. binoculars would also be useful. This is a moderately active holiday and you need to be prepared for different terrains from wildlife parks, to rocks, temples, beaches etc. trip: a guide, a driver and assistant. certainly not be the last. Their intimate knowlege and affection for this part of Asia shines through, and enriches the experience for its customers. revenue to the local community. benefit and enjoyment to the group. reasonable cost of this holiday. highlight!It felt like a two week immersion course in Sri Lanka, rather than a sequence of “tourist” activities. don’t forget flipflops and shorts/skirts which cover the knees for temple visits. plastic water bottle use can be avoided. returned feeling that we really did see some of the “real” SL. The people :-) Especially our fantastic tour guide Indika who went beyond the call of duty and made Sri Lanka come alive. Our driver Anil and helper Hermanda were also extremely conscientious in keeping us safe and happy. Too many highlights to mention! Take some good binoculars to magnify the stunning scenery, animals and birds. Don't miss the Temple of the Tooth at Kandy but try to avoid a Poya (Moon day) if you don't like crowds. Apart from one hotel that fell below par all our accommodation and food was excellent. The best run tour we have ever been on. Sri Lanka had everything we love in a holiday, Culture, Wildlife, lush contryside and beautiful beaches. The forest lodge in Habarana was excellent off the beaten track with wonderful hosts. Seeing the baby turtles hatching at Rekawa and the leopard at Yala was also an exciting experience. amending the itineraries within the next couple of days to avoid disappointment. We thank Barbara for her comments on the tour and are so pleased she enjoyed the variety that the itinerary offers. It was good to know that the tree houses which was an alternative to the camping on the itinerary proved to be a high point (literally). We are sorry however that Barbara felt that the guiding fell below our high standards. The tour was escorted throughout by a Sri Lankan national who is, of course, a local guide and use National Park guides whenever we are visiting the National Parks. We have a number of Sri Lankan guides working for us and this guide has proved popular on previous tours, we are looking into why he was not at his best on this occasion. As part of our Company's commitment to responsible tourism, we keep small groups (max 12 and on this occasion 5) which enable us to eat in local restaurants, stay in locally run hotels and reduce environmental impact on places we visit. We will be using Barbara's comments as part of a review of the tour and also looking at accommodation used to keep the itinerary exciting and fresh. We will be happy to highlight any changes made with anyone wishing to join one of these tours. Be prepared for the cultural diversity with this country and keep humour and kindness when dealing with local demands. Accept that the people are by nature friendly and are not always trying to fiddle you. However be aware that some of the locals are strapped economically and are trying their best for themselves and their families. Be prepared for sometimes not getting straight answers to political questions you may ask, there is some anxiety and fear experienced by people who are undergoing transitions in political management. Be prepared for the heat and how it tires you out, watch the bottom of your feet they get burnt if you are a temple seeker, take an old pair of socks .